Modified? Repetitions and movements performed in any combination to reach totals as fast as possible. This means constant motion, squat while you recover your push up form or sit ups while you recover from push ups, but nobody should be still. I’ll be there at 1730 – God willing, the creeks don’t rise, and the ibuprofen kicks in. This is so bad. I just thought I was sore yesterday. Oddly, the squats didn’t bother me at all during the workout but now is very, very bad. I did 20 of each movement 5 times with a time of 17:00. 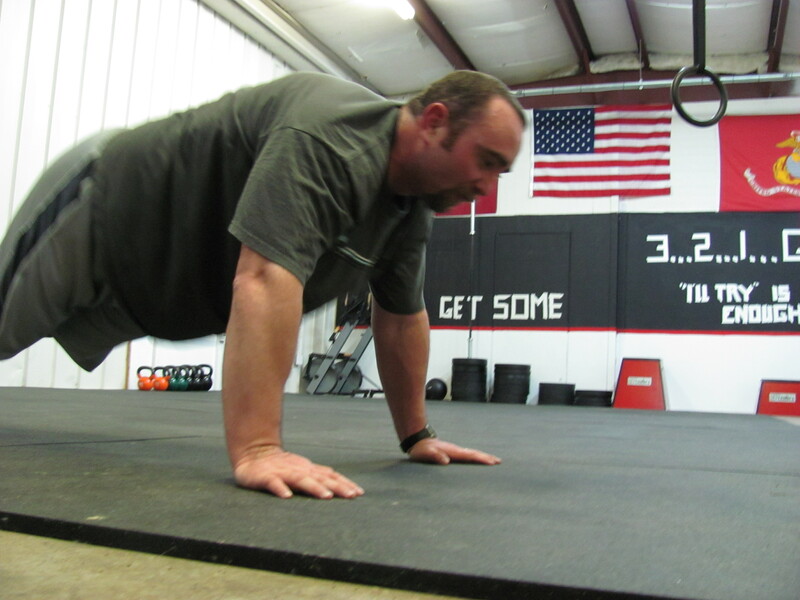 I was pleased with the time, push ups were definitely my limiting factor. Brad, missed you this morning. Adreena, It was great working out with you this morning. Will, I am so impressed that you came back 🙂 Drew, The little mouse was at CFSB. Where were you? Jim, Great job this AM! Zach, Thanks for motivating me. There is not a real mouse in the gym. It is a reference to a story Drew shared about a fictional mouse who watches what you do! If there was a workout to miss, then this was it. I can hardly walk as it is from yesterday’s bugaboo. I can’t imagine following that up with Angie. I grimace everytime I drop something, knowing I have to pick it up. See you in the a.m. Skipped the Push-Press cuz the shoulder’s acting up. Did the WOD in 17:24 but with the blue band for pull-ups. Brad – you da man! 100 pull-ups and you made ’em look easy, great job. Nico – your Push-Press was looking good toward the end, great improvement in form! Linda – you were AWESOME! Way to hang in through a nasty workout. Let me add my congratulations to everyone who pushed through this. Yesterday will be talked about for some time and yes I wanted to dog pile on that. Knowing you have Friday off I wanted the week to take a cumulative toll, we can’t become 10 minute specialists. Again you worked your selves raw yesterday and showed up for some hair of the dog today, I can’t express enough how impressed I was with both your effort and performance. did we leave Ana’s bear there tonight? Will the mouse leave him alone? What warriors we have at CFSB. To do bugaboo yesterday and Angie today. What a way to kick 2009 out the door. We missed bugaboo but did Angie today. OMGOSH! Worked on Push press and got to 60# for 3 reps. Tried 65# and got 2 out of 3 reps in before failure. Did Angie with assisted push ups, ring rows, abmat situps and squats. Took this on in 25 reps bites for 4 rounds. Total time….wait for it…..28:43. Great working with NIko, Brad (lifesaver with a scrunchy) and Tim. See ya’ll next year. Drew, Nico, Adreena, Will – glad to have you join us. A tough week to start. But, really, is there any such thing as an easy week?